Some pilgrims take bath in all 25 tirthas before beginning Braja Mandala parikrama. Lord Caitanya and Lord Nityananda both took bath in all these ghatas before doing Their parikrama of Braja Mandala. There is an interesting road, south of Visrama Ghata, that runs along the Yamuna, in the area where these ghatas are located. Many people visit this area. One can take a peaceful and interesting boat ride on the Yamuna near Visrama Ghata. To visit the 25 ghatas along the Yamuna takes about 45 minutes. Siva is the eternal guardian of the Braja Mandala area. Because he is the guardian one are supposed to ask his permission to be able to successfully circumambulate Braja Mandala. He is the greatest Vaishnava. 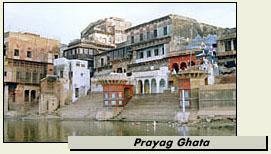 There are four important Siva temples that surround Mathura. There are four Siva-lingas that protect the four sides of Mathura, which are called the dik-pala (protectors) of Mathura. They are Gokarnesvara Mahadeva in the north, Pippalesvara Mahadeva in the east, Rangesvara Mahadeva in the south, and Bhutesvara Mahadeva in the west.